“Our desire is to meet the present needs of the community with our venue, and this partnership with the Movement Center affords us that opportunity,” Docusen says. The multi-purpose venue will also be the home for UrbanPromise’s second neighborhood site in Charlotte. UrbanPromise reaches younger children through afterschool and summer programs and raises high school leaders (called “StreetLeaders”) who are employed and empowered as mentors and counselors for the younger students who attend these programs. The Movement Center is a 40,000-square-foot warehouse being transformed into a collaborative project, which includes space for the Harvest Center, Agape Love Christian Ministries, TEAM, and multiple non-profits that are yet to be announced. 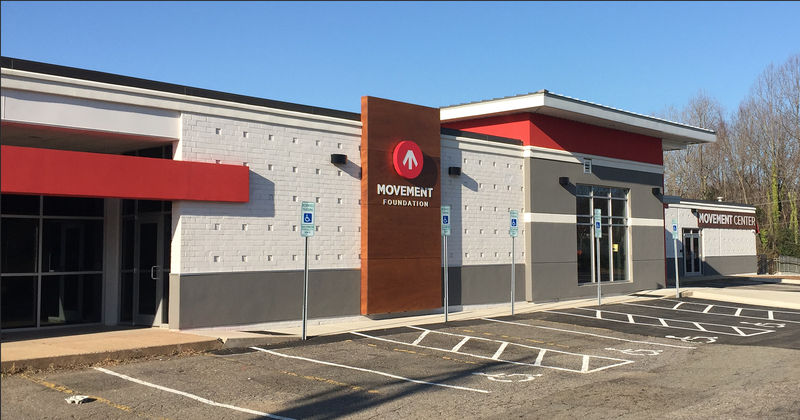 The Movement Foundation has invested more than $3 million into the infrastructure of this building, and the lease rate has been offered to these non-profits well below market value to increase their capacity to invest into the community. “The collaborative nature of this project is what got us excited about this opportunity to partner with organizations that have a common goal of reaching the West Charlotte community with the love of Jesus,” Docusen says. The construction project will include a 300 seat multi-purpose venue, multiple classrooms, and office space for staff. The move-in date is scheduled for Fall 2016. The total cost of construction is $650,000, with $300,000 in donations already secured from the Movement Foundation and multiple donors from the community. The remaining $350,000 will be raised through a capital campaign that the church will launch on April 3. ABOVE: Pastor David Docusen and Brett McDonough (Movement Foundation) sign the lease agreement at Pinky’s Westside over lunch on March 8th. BELOW: The left entrance to the building (with the red trim) will be home to the Center City Church multi-purpose space, with additional space for classrooms and office space. Wow wow wow!! Really excited. God is always Good, am I right? !